On the 21st January 2017, Wayne Rooney scored a brilliant free-kick to earn Manchester United a dramatic equaliser against Stoke in stoppage time. That goal also saw Rooney overtake Sir Bobby Charlton to become United's greatest ever goalscorer by reaching the landmark of 250 goals. Rooney would score three more goals in a United shirt, bringing his overall tally to 253, before he re-joined Everton in the summer of 2017. An incredible record-breaking United career came to an end, thirteen years after it began when Rooney was a fresh-faced 18-year-old. Born in Croxteth, Liverpool, Rooney grew up an Everton supporter and at that point seemed a long way away from Manchester United, given the city and club's long rivalry with Liverpool. 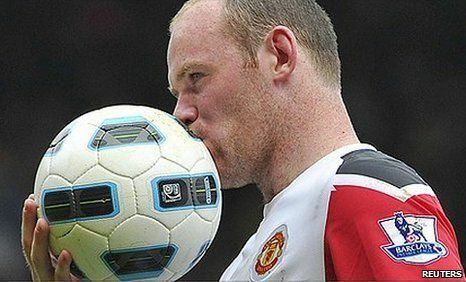 Rooney joined United from Everton in September 2004 for £33.3 million. His debut for his new club began with a bang on the 28th September 2004, wherein he scored a hat-trick to begin his road to 253 goals in a United shirt. Rooney would score a further 14 more in 2004-05 as he finished the season with a respectable 17 goals although his club would finish the season without any silverware. Wayne Rooney scored twice in the 2006 League Cup Final success over Wigan Athletic for his first silverware with United and followed that up with his greatest goal-scoring season yet in 2006-07 as his 23 goals in all competitions helped United win their first League title in four years. In 2007-08 in Rooney's and United's most successful season in almost a decade, he smashed 18 more goals in his first season in the number 10 shirt which had been vacated by Ruud Van Nistelrooy the previous year. In the iconic shirt, Rooney went from strength to strength, as he assisted the club in winning a historic League and Champions League Double. 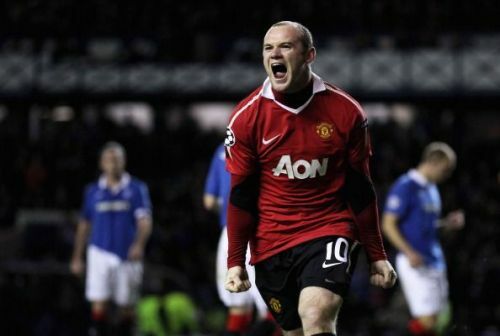 In December 2008, Rooney was the player of the tournament in the FIFA Club World Cup and scored the winning goal in the 1-0 success over Japanese outfit, Gamba Osaka. Rooney ended the season with 20 goals in all competitions as his goal-scoring once more assisted United in their League success. United became even more reliant on Rooney in the 2009/10 season, which saw him score his 100th United goal in August and United's number 10 continually delivered with his finest goal-scoring season ever, as he plundered an incredible 34 goals in total. Rooney was named the PFA's player of the year. Rooney continued to be United's main man in 2010/11, a season in which he tried to engineer a move away from the club stating that they lacked ambition. However, he would soon do a dramatic U-turn and sign a new five-year contract. His famous overhead kick came in the Manchester derby versus Manchester City which proved to be the winning goal. Another incredible performance came in the come from behind 4-2 victory over West Ham United, in which Rooney scored a hat-trick, however, he was subsequently suspended when he was caught swearing into a pitch-side camera. United were League Champions once again, a month later. In 2011-12, United ended the season empty-handed, when Sergio Aguero's brace versus QPR saw Manchester City pip United to the Championship. Rooney had been seconds away from being the hero after he scored the winning goal against Sunderland that would have clinched the title for United. For Rooney personally, it was a successful season, with 34 more goals added to his superlative tally. Sir Alex Ferguson's final season in charge of United saw the club win the League for the final time. Rooney's form dipped in 2012-13 following the signing of Arsenal talisman, Robin van Persie. Van Persie's 29 goals won the title for United and Rooney was moved to midfield to make room for the Dutch superstar. At the end of the season, Rooney was unhappy again and handed in a transfer request. As it turned out, Rooney didn't move clubs, but he was not the same player again. The season under new manager David Moyes was a disaster for United but did see Rooney notch his 200th goal for the club. 2013-14 saw Louis Van Gaal take over as United manager and saw an upturn in form for Rooney who clocked up 19 goals in all competitions. He added 14 more in 2014-15, then 15 more in 2015-16 where he completed the full sweep of domestic trophies by winning the 2016 FA Cup. Jose Mourinho was appointed the new Manchester manager soon after the FA Cup success and stated that he saw Rooney as solely a striker and not a player who plays further back in midfield where Rooney had spent the majority of the past two years playing. Mourinho's bold proclamation put himself in a difficult situation. Rooney no longer had the pace to play effectively as a centre-forward or the skill or guile to get into goalscoring positions in the box consistently. With new signing, legendary striker, Zlatan Ibrahimovic scoring for fun and midfield positions taken out of the equation, Rooney had nowhere to go except the bench. When United began to perform better without him in the team, Rooney was never a consistent starter again. This proved problematic. Rooney was a player who always performed better when he was playing lots of games - he was never an impact player, effective in small doses or from the bench. It just didn't suit his body. Therefore, rather inevitably, 2016-17 proved to be Rooney's last in a United shirt, given he was no longer a focal part of the team. It was a slightly ignominious end to a legendary United career by a man whose final season was unquestionably highlighted by him, breaking Charlton's goal-scoring record. He also found himself with another League Cup winners medal and a Europa League winners medal for the first time in his career. Rooney, a record-breaker and the greatest goal-scorer in United history, will be remembered even more fondly than he presently is, in the future. Who could have predicted that a boy from Liverpool would hold the record as the greatest goalscorer in Manchester United history? It is a record he will likely hold for a very long time. Can Romelu Lukaku fill Wayne Rooney's boots?